Step-By-Step Instructional DVD - 1 hr, 22 min. Learn the ins and outs of the amazing INCRA LS Positioner, including the INCRA Wonder Fence with its advanced split-fence and variable gap width applications. This professionally made video is no lightweight at 1hr, 22min in length. Individual chapters provide easy access to specific operations, and you can put the DVD in your laptop computer and haul that information right out to the shop! Already own an INCRA System? Although the various Incra positioners differ mechanically, they all operate on the same principles. 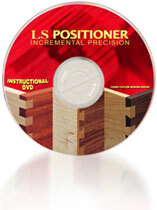 This video was produced specifically for the LS Positioner, but it's PACKED with information that's of great value to owners of earlier systems. Why? ... because joint-making procedures are the same for all INCRA models.